NGC 1398 - Isolated barred spiral galaxy located in the constellation of Fornax. Image by Muir Evenden. 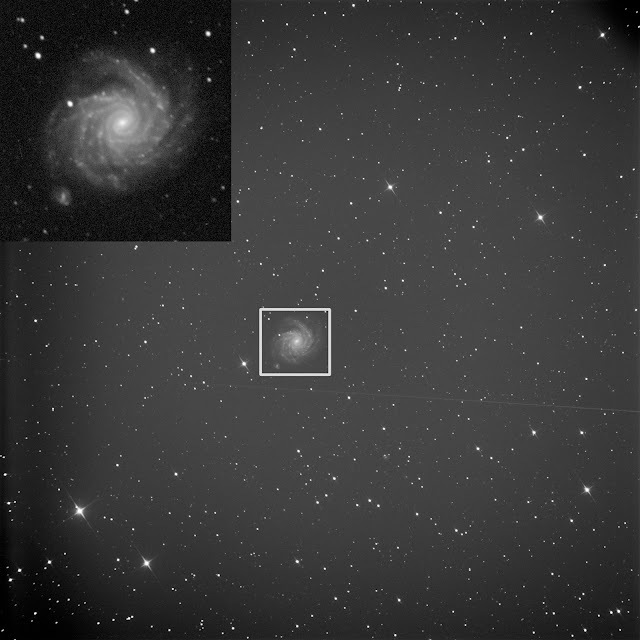 The real fun part comes, however, when the results from our testing give us little surprises and reconfirm just how good an imaging platform the ATEO telescope really is. A case in point occurred about a week ago as we were testing the cooling capabilities of the FLI camera; after we got the camera down to -46° Celsius we decided to image a number of galaxies that were relatively low in the sky (< 30° above the horizon) for one single 15 minute exposure each... The only image reduction done was applying darks. As the few sample images from that session shown below attest to, we got some quite stunning images; aside from some slight guiding errors and potentially some focus improvements, we were quite pleased! NGC 1232 - the Intermediate spiral galaxy in the constellation Eridanus. Image by Muir Evenden. The wide field of this scope has also proven to be a real treat as well - it is fun to identify all the additional galaxies and other objects that appear in addition to our primary target. Who thought testing would be so much fun?